The worldwide enterprise videoconferencing equipment market has been experiencing some downs lately — with consecutive quarters and two years of declining revenue growth in 2013 (-13.1%) and 2012 (-5.0%). This is mostly attributed to the impact of delayed customer buying decisions, lower-cost systems, more software-centric solutions, and the rise of cloud-based video services offerings for business. On the bright side, most or all of the videoconferencing equipment vendors are now offering cloud-based video alternatives for customers — in addition to their own lower-cost, premises-based systems. Also, positive trends we see include the increasing uptake of video collaboration by small workgroup, desktop, and mobile users; new video deployment options expanding the market to midsize and small companies; more business-to-business (B2B) and business-to-consumer (B2C) video use; and interest in browser-based video collaboration. 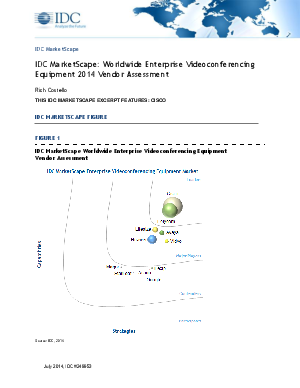 This IDC MarketScape examines the key players in the worldwide enterprise video equipment market, analyzing their current capabilities as well as longer-term strategies that impact their ability to service customers and gain market share going forward.